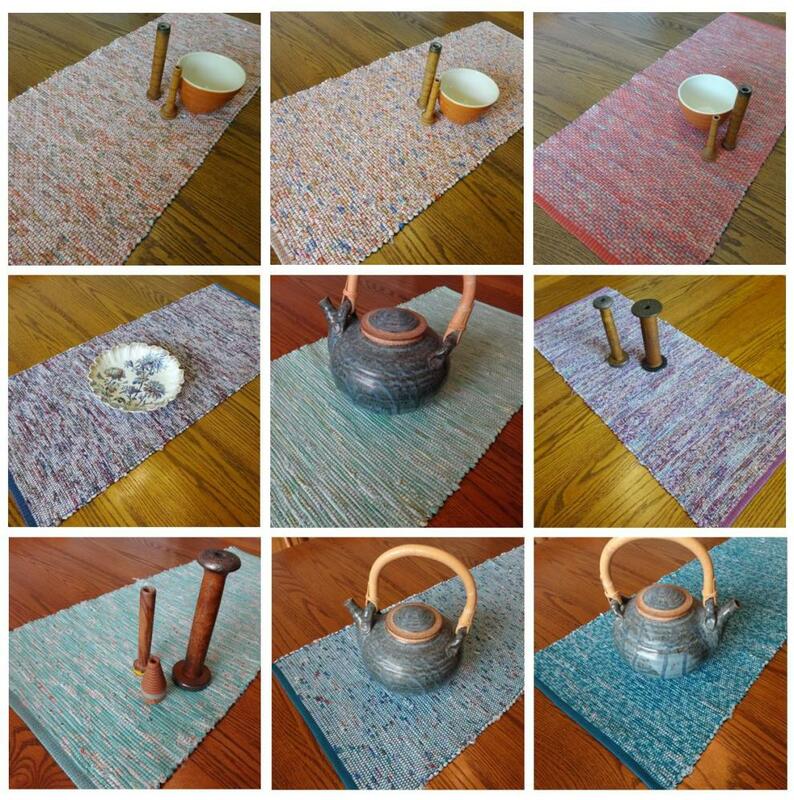 I finished the table runners from the ASG Make-It-Take-It day. The purple one was quilted stitch in the ditch and then binding sewn on - wasn't as happy with the odd angle mitered corners on my binding as I wanted. When I got to the gray/teal runners (buffet & table) I was using different directions for the mitered corners and I'm much more pleased.........still not perfect but much better. These runners were also quilted by stitching in the ditch. I had some 4 patch squares left so I made 6 quick and easy quilted mug rugs/coasters. Now I'm back to working on the wall quilt for over the couch. It doesn't quite fit on my work table but not too much hanging over the front & back for the photo. Yesterday morning I just decided I had to quit designing and re-designing and just go for it so I started cutting out 8" squares. I laid them on the floor and played with moving them around, some I never used. So now the background is sewn and is around 45" x 52", give or take. I had Sam hold it up over the couch to see if this size is good and it's perfect. Of course this is over the old couch - we're still waiting for the new sectional in a charcoal gray - looks to be another 2 months. Yesterday afternoon I drew out gingko leaves, some using stencils. This morning I scanned them in the computer to make larger patterns, printed and cut them out. Here the paper pieces are sitting on top of the pieced background - When I'm happy with the layout I'll use these paper pieces as patterns to cut out the gold fabric for the gingkoes. A couple posts ago you can see the gold fabric that will be the gingko leaves. I'm thinking I'll fuse them to the background and then do a narrow zig-zag around the edges, or maybe even just straight stitching - I haven't decided. I'll be doing some sampling before I get to that stage. Originally I thought I might also do some stenciling with shiva paintstiks but I'm thinking not, I don't want it to be too busy, it's already got a lot going on with all the different fabric squares. I have no clue what type of quilting I'll do - maybe free motion??? I'll need to practice that if I go that way. Maybe in the free motion some gingko shapes??? I definitely need to get some feedback before I go any further. In the midst of the sewing the kitchen was torn out on Monday. The fridge, stove and a folding table are sitting in it at the moment, dishwasher is in the garage. Much work by Sam this week replacing drywall where the old backsplash was removed and most of the wall came with it. Plywood to bring the floor up to the wood floor height under the cabinets as that was never done when the house was originally built, electrical work and plumbing work. There's still a little bit of texturing to be done on the walls, then we're ready for the new cabinets which we're hoping will be finished this week. After that the granite guy will be out to do a final measurement to cut the granite. We still need to pick out backsplash but we'll do that once cabinets & granite are installed - will bring home samples to audition when the time comes. In the meantime we're eating very simple meals, take-out or going out. Yesterday was our local ASG (American Sewing Guild) chapter's Make-It-Take-It day. For a very nominal fee of $15 I could take 3 classes and it included lunch, not to mention getting to visit with other sewers/quilters in our region that I wouldn't normally see. I pieced this runner. It's really long and will just fit on the buffet. I've already cut out more pieces to make a smaller runner for the table. It will still need to be layered with batting and a backing fabric and then I'll need to quilt it......most probably stitch in the ditch. Here is the pieced runner top from another class. It's pretty small, not sure where I'll use it, maybe I'll make another one larger and use this one for a gift. This was called the easy peasy runner because it's ironed onto a grid stabilizer and then folded to do the stitching - very quick piecing technique. This one also needs batting, backing and quilting. The instructor for this project was the president of our local ASG chapter - big thanks to her for all her organizing skills and work in our region. My third class was making these Swedish stars out of fabric strips. A bit fiddly on the first one but then once over the learning curve it was easy. The instructor made over 80 of these for gifts - yikes - that's a lot of stars. 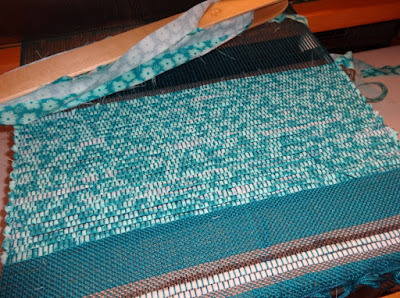 I haven't gotten back to that gingko quilted wallhanging I want to make - there just hasn't been time and I don't see much free time this week to work on that or finishing up the table runners. I did buy a few more pieces of mostly black fabrics that may replace a few of the others that I wasn't happy with in the mock up. We've emptied out all the kitchen cabinets and are ready for kitchen cabinet demolition tomorrow morning. They have to be removed to get final measurements for the peninsula. 'Hopefully' the following week new cabinets will be in and the granite guy will be out to make the template for our countertops. It's going to be a disaster in here for several weeks and probably some eating out. I feel like I've been at a standstill trying to design a quilted wall hanging for over the couch. We have a big blank space that needs something. In our last house the couches were not up against walls and the major walls were all glass windows in the living area so nothing huge needed. Today I decided I must start designing. I had looked at many gingko quilts online as inspiration.......I would have been really thrilled to have found a perfect pattern I could buy but nothing out there. So, I bought the fabrics - all the blacks, grays with bits of light teal and gold. I just bought on speculation not knowing what I was going to actually end up using. I made color copies of the fabrics to work from and started cutting them up into 2 1/2" squares. I then arranged them on quadrille paper I had already marked out to represent 50" x 60". I tacked the photocopies down with a bit of glue stick. My original thought was to use black for the gingkos which would then be embellished later with gold thread......but they were totally lost. I went to my stash of gingko fabrics, way too big stash, and found this gold so I photo copied it and cut out gingko leaves. This is now starting to look somewhat ok to me. Of course it will look totally different in real life as the 2 1/2" squares will actually be 10" squares so more of each fabric pattern will be showing. I won't know if I'll like that until I actually cut and lay them out. Picture this over a charcoal gray sectional. The accent pillows that come with the couch have gold in them plus I've bought fabric to make more pillows that are in grays with golds, rusts and light teal. Hopefully the couch will be here in the not too distant future. We ordered it back in January but a month into waiting we were told the fabric had been backordered by the furniture manufacturer. It supposedly will be in sometime next month, we'll have the sectional in May......I hope the furniture store is correct about this. It took us forever to pick out the fabric so we're willing to wait for it. Should I just go for it??? The quilting I've done in the past has always been from patterns/instructions so I'm fretting over this. What's the worst that could happen??? I lose some hours and material - it's not the end of the world. But I'll think on this for a bit and move on to something else. I want to weave another warp of rag table runners but these for our house - grey print fabric already bought, cones of yarn sitting on top of it to think about what I'll use for warp. 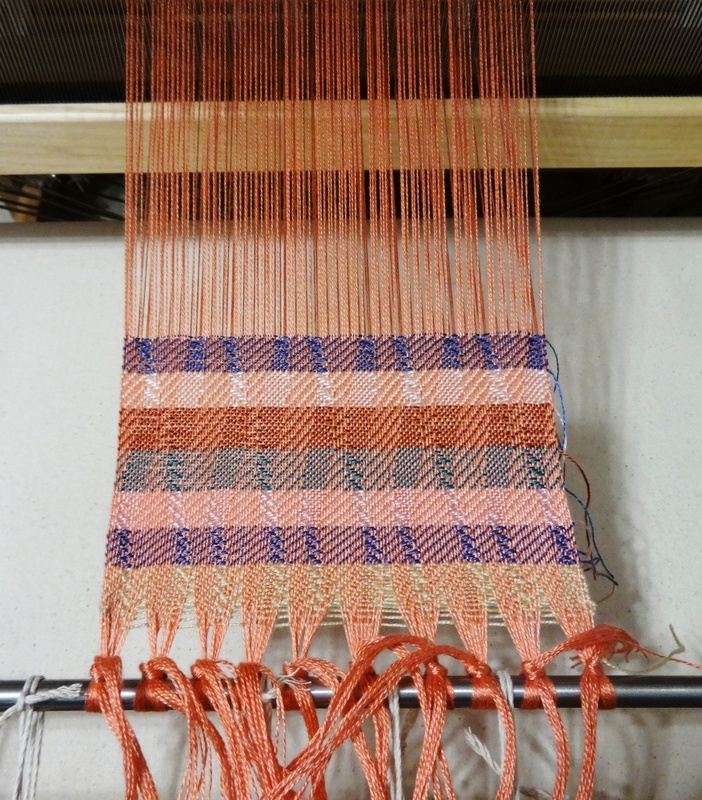 So, on to designing that - designing weaving comes much more naturally to me. And back to listening to the next in the Outlander series audio books - A Breath of Snow and Ashes - this one is 48 discs, I'm ready to start disc #3. Finally finished the tote bags for the head start kids. Some have appliques, some have pockets. I'm so excited to be ahead of the game with my charity/community sewing this year. I'm looking forward to working on some of my own projects next. Fleece hats for the Head Start kids. In our neighborhood group of the American Sewing Guild we make little tote bags for the Head Start kids for the holidays. We fill the bags with a coloring book, crayons, pencils, sharpeners, tissues, toothpaste and brushes and candy/treats. This year we're adding fleece hats to the totes. I've decided to get my portion sewn early in the year rather than doing it later when I'm trying to do my own gift making. 14 hats sewn. Hoping to finish up tote bags soon. ....but no, here it is again in this photo - see it along the left side - it looks like a spot on the towel. Then I held the camera up to the wall and yep, it was still there. We looked at the lens with a loop and could see something but no matter how hard we tried to clean it, it was still there. I have no clue what happened between last week and this to the camera, it was just sitting in its case right where I left it. This photo had the spot cropped out of it. I need to take photos of 5 colors of towels but have no clue if I can manage to take them all so I can edit out that spot. A new camera is on the horizon which doesn't make me happy as I love the one I have - it's small and takes nice pictures. 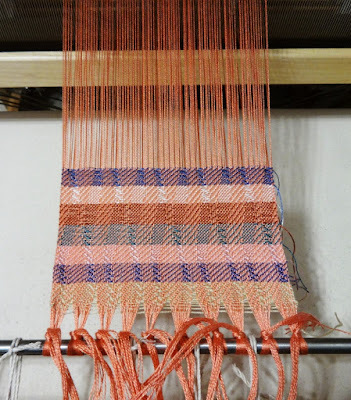 The AVL is still warped up for scarves, the loom at the beach cottage has a towel warp beamed awaiting threading of heddles & reed....next time over there. I want to start work on an art quilt for over our couch but I realized this month is when I take my machine in for cleaning/service so that will be put off for a few weeks - machine will go in this week. I do have an inexpensive Brother I use for classes that I can sew on if need be but I love my Bernina and how exact it sews so I'll wait until I have it back. Although 27 when we got up this morning it will get up to 60 by afternoon. It's time to get a trailer load of garden soil for the raised beds we've put in. I can't wait to have a little garden again. It's just two small 3x8 raised beds but it's enough for right now. If I feel like I want another couple beds I'll add them next year. I pruned the 2 plum and 2 apple trees last month in addition to the grape vines. I can't believe how much we have in this city lot. We put in a fig tree last fall and I can see a few leaf buds so it looks like it's made it through its first winter. The gingko tree we put in last fall also has buds all over it. So much yard work to do out front but that will come in time, a previous owner got the idea that half the front yard being gravel was a good thing - not!!! Yesterday a friend came over for our occasional lunch/Netflix/knitting get together. We were to binge watch the second half of the new season of Grace & Frankie but I had gotten Book Club movie DVD via Netflix by mail so we watched that instead. Lots of laughs. With what's going on in the world and our country it's so nice to watch something that's light and entertaining. I made a sausage, kale & potato soup. It's based on Zuppa Toscano at Olive Garden, my favorite soup there. I've made this recipe several times and it's a winner - it's from The Pioneer Woman's website. And I had enough leftovers to send some home with my friend and for our dinner tonight. It's not a heavy soup but it's also not a low-cal soup as it's loaded with whole milk, half & half and a splash of cream - but it's oh, so worth it. I've seen several recipes lately for roasted chick-peas. I've had a recipe from Two Peas and their Pod's blog along with a can of chickpeas sitting on the counter for a week so I decided to make those yesterday too for us to critic and snack on. Another winner recipe. I had some Moroccan spice blend in my pantry so that's what I used on these. The entire can of them is gone as of 5 minutes ago. Next time I make them I'll have to try a different spice blend. 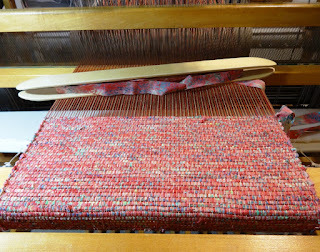 Have had no time for weaving for a few days - maybe tomorrow afternoon. I really need to get back to weaving or sewing so I can settle in to listen to my current audio book which is book 5 in the Outlander series - The Fiery Cross. I'm halfway through the 47 discs. Is anyone else hooked on Outlander? I know the books have been out forever but it really gained popularity again when Starz started airing an original series based on the books. The 4th season recently ended, it was based on book 4. New spring towel warp on the loom........first two in teal (underneath), next two this coral......thinking about a cherry yellow, aqua and lavender for the remainder of the warp. 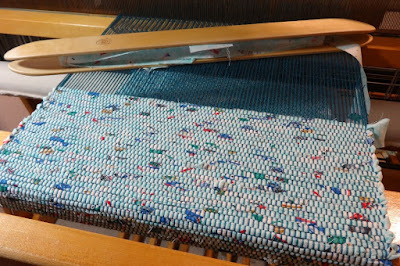 For those who may ask - this draft was originally horizontal ribbons by Amy Norris published in the Complex Weavers Compilation book, I think it was 20 shaft but I could be remembering wrong so don't hold me to that - I took the draft and turned it so I have vertical ribbons, it's now 32 shaft. Handwoven rag table runners for sale in my etsy shop - look for these in the table runner section of my shop. 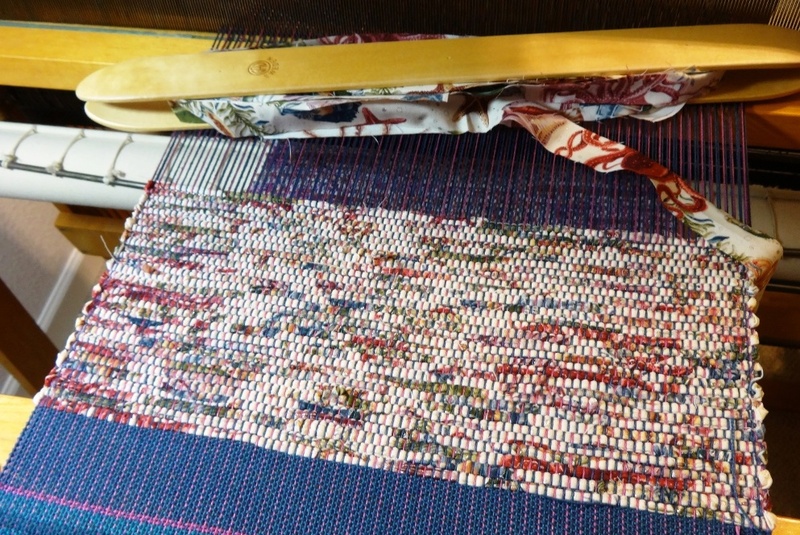 Calling these 'rag' runners is a bit misleading as they are made from high quality cotton quilt fabric cut 1" wide for the weft. .....and I decided to stitch up the country sheep on a seafoam green towel - love this for spring or easter.......also stitched up some more bunny towels. All are in my etsy shop ready to find new homes. 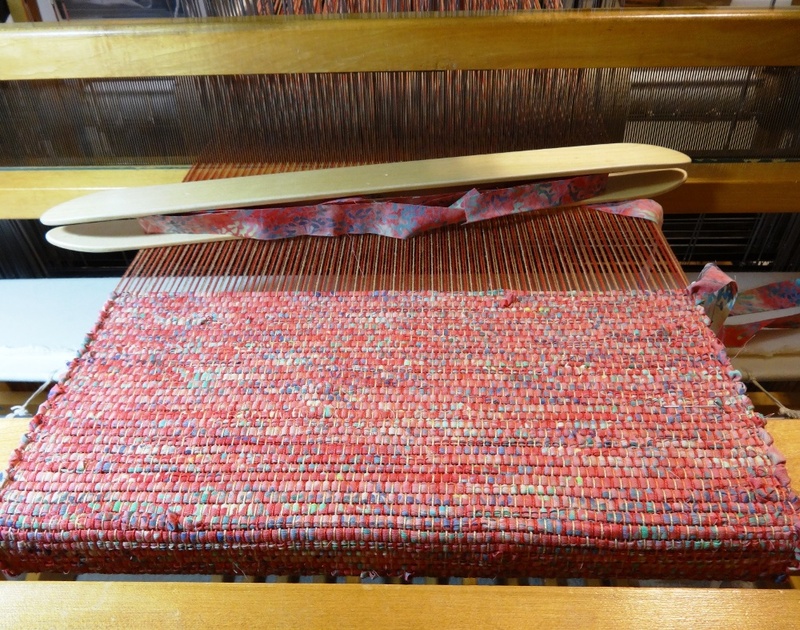 This type of weaving is usually called rag weaving, as in rag rugs.....in this case rag table runners. This comes from times when true rags were used for rugs rather than throwing those old clothes and sheets out, we'd call it up-cycling today. 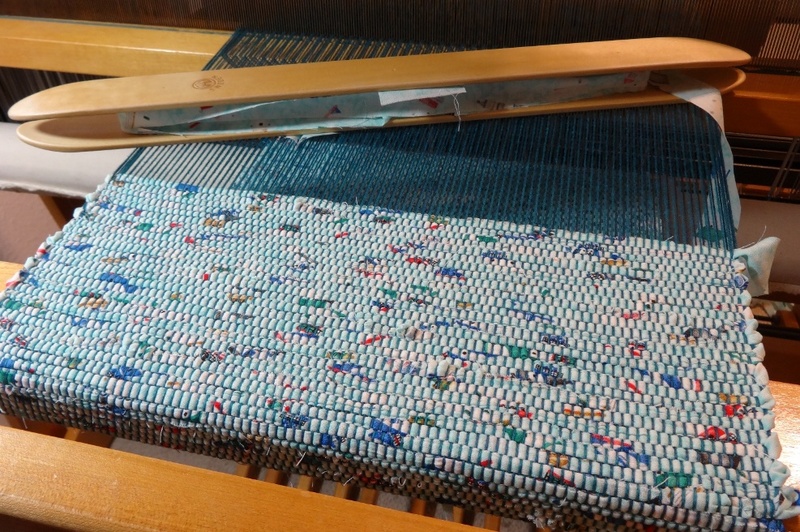 But can these runners really be called rag weaving - this fabric was never rags, it's good quality quilting cottons straight from the store..........after a lengthy stay marinating in my fabric cupboard. I need to come up with another name so those who may be interested in purchasing a table runner know it was not made of rags. 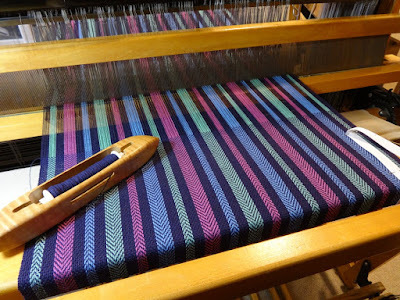 The other day I was getting ready to warp up the Macomber with another towel warp. Then I opened that cupboard and saw stacks and stacks of fabric and thought maybe some table runners were in order instead. I pulled out enough fabric for 9 table runners, that 2 yards each, that's 18 yards. Did it make a dent in the fabric cupboard - heck no.....but I'm giving it my best. There is still so much fabric in that cupboard. Actually it outgrew that cupboard and has taken over some shelves in another cupboard. Last week our neighborhood chapter of ASG (American Sewing Guild) got a request for pillowcases for those who lost so much in the fire in Paradise, CA this past November. I picked up some fabric at the meeting and whipped these 12 pillowcases up today. Someone from our region will be going down to Paradise to deliver them. We have many new transplants in our region from Paradise. I mean, what do you do when practically an entire town burns down. Not only does one lose their home but they may have also lost a job. The new owners of our Grocery Outlet are from Paradise, they owned a Grocery Outlet down there, it burned. The formers owners of the one here were looking to sell so it worked out for them to move to our area. Today I did some photography work - here are the latest towels to come off the loom, they are now listed in my etsy shop for sale. I hope buyers like them because I sure do, so much so I may end up keeping a few for myself. Next up is to pull out some 6/2 cottons for towels, I don't often weave with this thicker cotton but it does make a nice thick and thirsty towel. Would love to use it all up and empty that section of the shelf to make room for the cones of chenille I brought back home from the beach cottage. So, new project planning coming up next. Last February I joined in on a quilt project from Sew Cute quilt shop in Dillard, it's between here and the coast. Each month for 9 months I religiously picked up my packet, the first month also included the booklet and some templates. Did I start any of these, heck no, I didn't have time..........I was getting a house ready to put on the market and packing up much of my studio so it showed better. So, a year late I will be starting it - whoo hoo. 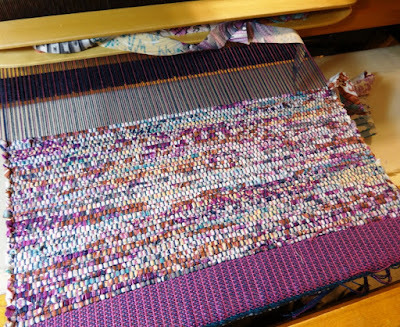 I'm not going to get obsessed with working on it all the time, will just do it here and there because I want to have plenty of time to weave, spin, knit, sew, etc. This shamrock towel is for sale but I need to do the photography work for my etsy shop as I stitched it on a different towel than last time. Some other shamrock designs to be stitched today. Hopefully this week with the torrential rains coming to an end early in the week I'll have some good light for photos. Mind you, I am not complaining about the rain - we really need it but it could be spread out a bit more, there's widespread flooding at the moment. As my friend JoAnn says it's raining pitchforks and shovels. I got an email from my local ASG (American Sewing Guild) about making quilt blocks for quilters who lost homes in Paradise, CA (just down I5 from us here in Southern Oregon) in the raging fire late last year. It's being coordinated by a quilt shop that I understand was in Paradise but is now in a different town. There was a pattern included although one could make up their own house block designs as long as they were a 10 1/2" square. We were to write somewhere on them with fabric ink inspiration, our names and town. Here's what I came up with using fabrics from my stash - 4 blocks. Now I need to get my blocks to someone so they can be mailed with all the others from our area. I was wondering why all of a sudden the birdseed in the round feeder was disappearing quickly. A squirrel has found us - I hadn't seen any in the yard until this last week. Bailey hates squirrels so this new development should be interesting once he figures out those squirrels he thought he left at the other house have sent their relatives here. He got tired of me watching him so turned his back on me. He better watch that tail because this feeder is low enough that Bailey could reach it. 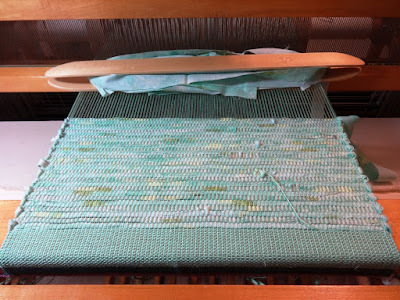 Got started weaving on the towel warp - only two towels woven though as we had to take advantage of beautiful afternoon weather to prune the small area of grapevines we have. 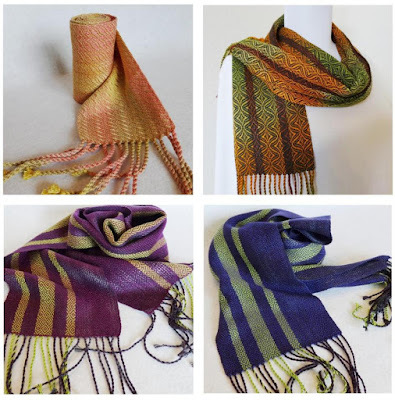 Perfect cheery colors for winter weaving. Day started out below freezing with freezing fog but by early afternoon it was warm and sunny, warm enough for no jackets. Grapevines hadn't been pruned in who knows how many years.....one of them supported with posts and wire as it should have been....the other had grown into the deck railing and fencing, never had any kind of traditional vine supports. We fixed that putting in posts and wires and after trimming winding remaining vines on the new wire - hopefully it will do well. Fruit tree trimming will be coming up soon, most probably next month. That will be another huge job as those 2 apple & 2 plum trees probably haven't been pruned in many years. Already seeing new buds on the rose bushes and trees - it's only January! I finished plying the lime/purple spinning. I haven't blocked the skein yet, nor measured how many yards I've got yet. Not sure what it will grow up to be, will go on the shelf until an idea pops into my mind. My feeders pull in lots of little birds like chickadees, pine siskins, finches and the occasional big stellar jay, but the other day I saw a bird I didn't know on the suet feeder. I asked my friend and big time birder Yvonne what it was as looking through the bird book is overwhelming to me and even then I'm most often wrong. It's a starling. I see starlings in flight but have never seen one close up, I didn't realize all the colors and spots in their feathers. I am loving having feeders at this house - at our previous house the bear could get the feeders no matter how high we hung them on cables between trees. 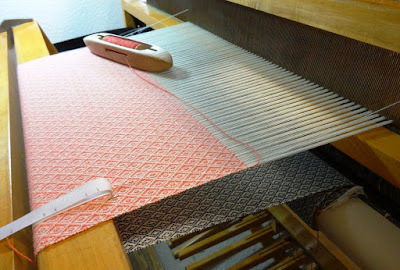 Yesterday I spent part of the day winding a 12 yard towel warp. 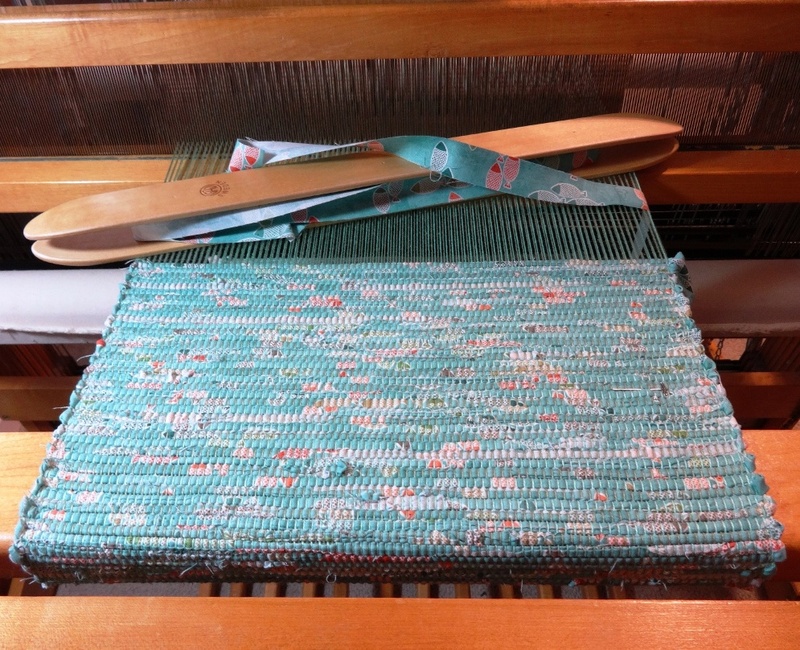 It really pushes my lower back to wind this much on the warping board so I took frequent breaks. It feels good to finally be getting back to the loom. I may also warp the AVL in the next week. 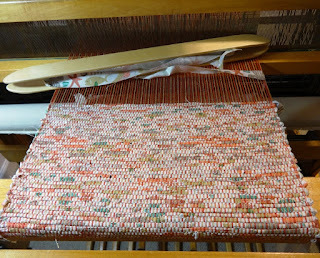 It's now wound on the back beam awaiting threading of heddles and sleying of the reed - but I'm so busy the rest of the week I'm not sure when that will get done. This warp was originally going to be white, black and blue but then I decided it needed to have a lot of color for foggy winter weaving. It will be a basketweave and twill design. I went through my stash and found colors, blended other colors, to spin to ply with the Inglenook 12 Days of Christmas fiber. 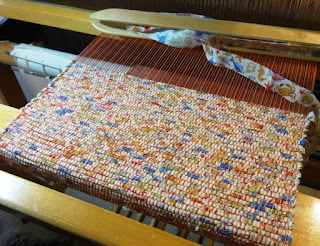 Should be interesting to see how it ends up looking when plied - hopefully it will be a success. Only 1 more day, today, left. My plan after that is to spin solids from my stash to go with all these to ply with. I've already got the majority of them together, just waiting to see today's package to finish them up. In the meantime I'll keep working on the lime/purple roving. http://eweniquelyewe.etsy.com/ - showcases my handwovens, knitted & felted items, machine embroidered items and other assorted goodies.